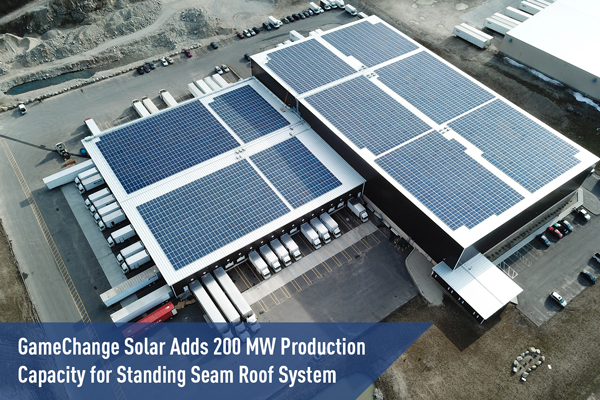 NEW YORK, NEW YORK – March 4, 2019 – GameChange Solar announced it has added a 200 MW production line to expand its reach into the growing commercial rooftop market for standing seam solar systems. Brad Sherman, Director of Business Development at GameChange Solar, stated: “With the addition of this new 200 MW line in Pennsylvania, GameChange has substantially increased production capacity to help facilitate the rapid growth in the commercial rooftop PV structures market. Our standing seam system is a complete offering which enables one stop shopping for customers seeking value pricing and ease of install."